The Volcanic Eruptions Paperweight creates a volcanic eruption right on your desk or in your hand! Simply invert this egg shaped paperweight for a few seconds to a minute. Lava beads collect inside the volcano and then erupt when turned over. Watch as the red "Lava" shoots out the top of the volcanic mountain! Eruption lasts over 2 minutes! Turn it over to see the action again Simply turn the volcano upside down to get the sands within ready. When you put it back down the sands will flow upwards through the watery interior of the egg shaped container. As an added bonus, the weighted orb will keep those papers from fluttering around on your desk. 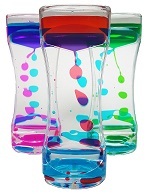 Use the Volcanic Eruption Liquid Motion Toy as a paperweight or a soothing visual aid. These Mesmerizing red beads have a calming yet exciting effect . Good for visual and sensory stimulation. Clear Egg shape container with volcano inside with red beads that erupt. Volcanic Eruptions paperweight measures approximately ~ 3" tall and 2.2" wide.